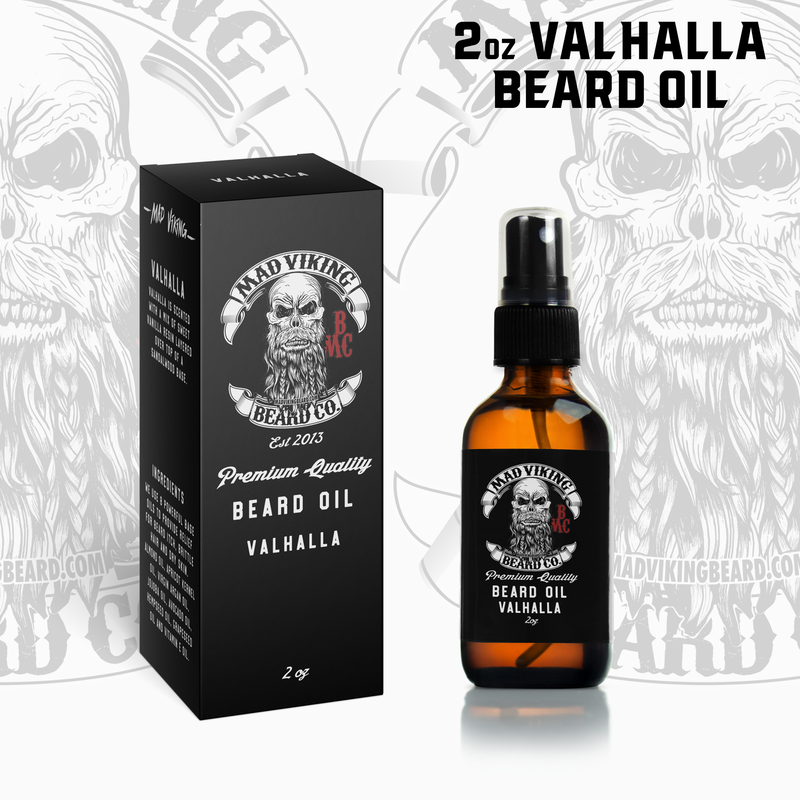 Mad Viking Beard Company Oil Ingredients - Mad Viking Beard Co.
We get questions almost daily as to what we put into our beard oils. While we will not get into the proper percentages and other detailed info on our recipe in this article, we will give you a quick breakdown on what goes in and how it benefits your beard and the skin underneath. So thank you for taking the time to research our ingredients. All of our oils use that same base carrier recipe as listed below, with a brief explanation as to their usefulness. We only use the finest ingredients available because we want your beard to be clean, happy, healthy, growing, dandruff and irritation free! Sweet Almond Oil is the oil that is extracted from Sweet Almonds. Although it’s primary function is to act as a “hair protector” and sealant, It is rich in Vitamin A which is good for maintaining healthy cell membranes. It also contains a large number of Vitamins B1 and B6 which have been shown to promote hair growth, Vitamin E, which in essence, means that it is rich in antioxidants, and increases blood circulation to the applied area, which helps with nutrient delivery. Sweet Almond oil is also loaded with saturated and Monounsaturated fatty acids so it does a good job penetrating the shaft of the hair and moisturizing from the inside. Along with the above benefits (which are pretty awesome), it also does a fantastic job of making your beard shiny, silky, and vibrant. The Apricot tree is a part of the rose family. It originates from Central and East Asia. The oil itself is derived from the dried seeds of the fruit and is composed mostly of oleic and linoleic acid, both of which are unsaturated fats and help your skin maintain it natural moisture balance. The oil also contains Vitamin A, Vitamin C, it’s rich in Vitamin E, Potassium, and dietary Fibers. The oil itself is a very light oil which does NOT leave a greasy feeling on the skin or hair. It absorbs quickly into the hair and skin and helps it moisturize internally. AKO is also shown to relieve the itch and irritation of eczema, and reduce the appearance of wrinkles. While Mad Viking makes no claims regarding speeding up hair growth, we do recognize the fact that AKO improves hair texture and provides a better environment for hair growth. Argan Oil is derived from the fruit kernel of the Argan tree, which is native to Morocco and a few other places of the world. It is a fantastic addition to our beard oil because it is high in Vitamin A, Vitamin E, Omega 6 and 9, and unsaturated fatty acids, and plenty of antioxidants. Argan oil is excellent in the use of adding moisture to hair, taming frizz, doing away with split ends, adding moisture to coarse hair, and adding shine, relieving dry and itchy skin. Jojoba oil is the oil that is produced from the seed of the Jojoba plant which is native to Northwestern Mexico, Southern Arizona and Southern California. Jojoba oil is actually a “wax” or mobile oil. Jojoba oil is used as a replacement for whale oil since the ban on whale oils in the U.S. in 1971. It is composed almost entirely of mono-esters of long chain fatty acids and alcohols. Which basically means it has an extreme shelf life and super resistance to high temperatures. It is very useful in sealing in moisture in the hair and on the face and helps create a barrier between the elements and the hair. The Vitamin E and Vitamin B-complex properties of Jojoba help with skin repair, keeping your face healthy. It controls hair loss and helps your follicles grow new hair, by seeping into your follicles and helping to dissolve any blockages and providing nutrients to the follicle. We use Avocado oil because it absorbs into the skin and hair very rapidly and has a high absorption rate which means that it doesn’t leave a residue behind. It is a nutrient rich oil containing the omega-9, monounsaturated oleic acid which controls water loss and makes your hair softer and more pliable. Avocado is also an anti-inflammatory and is a very good source of Vitamin E, which is known to improve skin health, and boost the immune system. Avocado oil also helps generate healthier skin cells, and is easily absorbed. Hemp seed oil is known to dramatically decrease skin dryness which in turn, alleviates itching and irritation. It has the perfect 3:1 ratio of omega-6 to omega-3 fatty acids, which matches the required balance by the human body. It hydrates, improves skin elasticity, soothes rashes, includes robust amounts of Vitamin D, which assists with the absorption of calcium, which in turn provides smoother and softer skin, Vitamins A and E, and contains small amounts of magnesium, iron, zinc, potassium and phosphorus. Grapeseed oil is quite simply oil that is pressed from the seeds of grapes. The oil is very light and thin. When applied it leaves a very light gloss on the skin and hair which helps with shine. It is high in Linoleic Acid. It is a very effective moisturizer and conditioner. It also has the ability to strengthen hair, stop hair loss, and correct dandruff. That’s right, good old fashioned Vitamin E. Why? Because it is that important. Vitamin E is a powerful antioxidant. It repairs damaged tissue. It helps build new tissue. It repairs damage to hair follicles, which makes healthy hair follicles, which encourages hair growth. It fights inflammation. It is quite simply, awesome. Phil Rigney Shares his Beard Journey. 5 Steps to a Healthy Beard.